There will be an option to either start the meeting on your browser or download the Zoom desktop client. Follow the instructions that appear on your screen. – We strongly recommend that you select the “Call me” option and input your phone number. You will then receive a phone call from Zoom establishing your audio connection to the meeting. This option will allow us to easily identify who you are during the Q&A session. Please remember to mute yourself once you are in the meeting to avoid any disruption. – If you would prefer to call in, the call-in toll-free number is +1 646 558 8656 (US) and the meeting ID for this meeting is: 265 957 956. Your participant ID will be indicated on your screen. 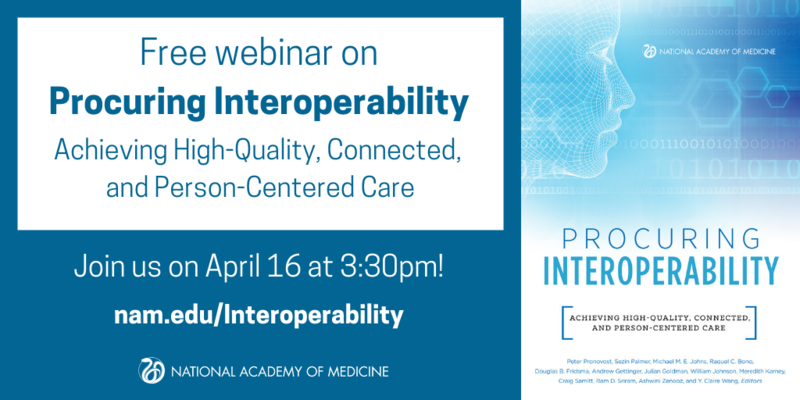 Join the National Academy of Medicine on April 16, 2019 for a webinar to discuss the NAM Special Publication Procuring Interoperability: Achieving High-Quality, Connected, and Person-Centered Care. Realizing the promise of digital technology will depend on the ability to share information across time and space from multiple devices, sources, systems, and organizations. The major barrier to progress is not technical; rather, it is in the failure of organizational demand and purchasing requirements. In contrast to many other industries, the purchasers of health care technologies have not marshaled their purchasing power to drive interoperability as a key requirement. Better procurement practices, supported by compatible interoperability platforms and architecture, will allow for better, safer patient care; reduced administrative workload for clinicians; protection from cybersecurity attacks; and significant financial savings across multiple markets. Join the NAM for an hour and a half long webinar where field leaders will discuss why interoperability is critical to the future of health care, the Special Publication’s proposal of a roadmap for using procurement specifications to engage those steps, and how all health care system stakeholders can accelerate progress in achieving system-wide interoperability. Due to a last minute scheduling conflict, Adminstrator Verma will not be able to join us. This webinar is open to the public and will be hosted on Zoom. Please register to attend by clicking here. Webinar login information will be sent to you prior to the webinar. The webinar will be archived and materials will be posted on the Procuring Interoperability publication page following the event. Questions? Please email Fasika Gebru at fgebru@nas.edu.